Our overall goal is to heal the problem and not just drug it. You will feel welcome the moment you walk through our door. Help in on it’s way. Our doctors do not use drugs that merely mask the condition, but use technical that helps the body use it’s natural healing abilities in order for it to function at it’s best level. As the body heals patients find their discomfort level drops with out the use of drugs. You can expect to be welcomed by our front desk staff when you arrive at our office. Typically, you should plan to spend about an hour at our facility. Your time here will include providing us with your personal/accident/insurance information, your consultation and examination with the doctor, and, in most cases, a full realm of treatment. Your treatment may include a therapeutic massage, ultrasound therapy, electro-stimulation, decompression therapy and a gentle spinal manipulation. You may be referred to our radiologist for imaging studies, typically MRIs. Depending on the level of discomfort the patient when they arrive in our office will determine what protocol that is followed. Acute issue treatment differs from chronic issue treatment. Our doctors understand “severe agony” and don’t want to leave you in anguish any longer then they have to, however information is needed regarding your health history. So a completed health history and some personal information will need to be provided before treatment can begin. Following the completion of the intake forms, Dr. Plummer will conduct a complete history and exam. 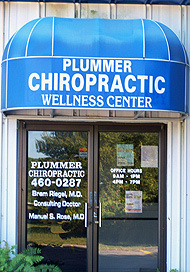 Dr. Plummer has received the best chiropractic education possible as Palmer Chiropractic College. Your spine will be examined for misalignments. This is done through motion palpation. X-rays or a MRI study may be ordered to investigate the root cause of your aches. Phase one begins with the issue at a manageable level. Dr. Plummer will then co-treat with physiotherapy massage, Thompson chiropractic technique or Activator Method. Massaging the afflicted area with ice is very beneficial at this phase as well. Phase two is once the initial swelling and discomfort has subsided. Other chiropractic adjusting techniques are included, such as Gonstead, spinal decompression, physical therapy and massage therapy. A completed health history and some personal information will need to be provided before treatment can begin. Following the completion of the intake forms, Dr. Plummer will conduct a complete history and exam. Your spine will be examined for misalignments. This is done through motion palpation. X-rays or a MRI study may be ordered to investigate the root cause of your issue. Dr. Plummer will then recommend Dr. Mason, if medicine can increase the body’s healing ability. We don’t use drugs to merely mask the condition, just to allow the body to be in a state where natural healing abilities can be achieved. Once the initial swelling and discomfort has subsided, other chiropractic adjusting techniques are included, such a Gonstead, spinal decompression, physical therapy and massage therapy. Your initial visit can last about 1 hour to 1½ hours depending on your condition. So please plan accordingly. Call today for your consultation and treatment. We offer same day appointments.